How do we compare our brains with those of extinct species? Because soft tissue decomposes quickly we cannot expect hominid brains to survive over the hundreds of thousands and even millions of years of evolution. Therefore, paleontologists must work with skeletal remains, using skulls and other bone fragments to draw inferences about the biology and behavior of early hominids. However, tools, animal bones, fossilized seeds, and even cave paintings (in the case of early modern humans) have been found alongside hominid skeletal remains, providing intriguing clues about the mental capacity of our predecessors. 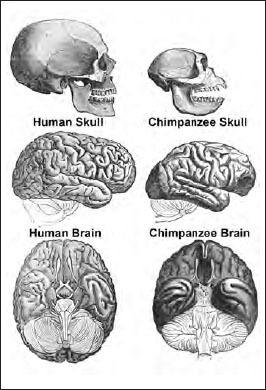 A comparison of chimpanzee and human brains and skulls. Chimpanzees are the closest genetic relative to humans (iStock).